Sweden's "Kitty Drew" series has been in print since 1953 and titles are still available today - Nancy and her adventures seem to have caught on quite well with the Swedes. Not only are the stories from the "classic" series available, this publishers has also produced volumes from the Case Files, Nancy Drew Notebooks, Girl Detective and Nancy Drew & the Hardy Boys SuperMysteries series. However, Wahlströms does not distinguish between the classic and case files and the titles are comingled in their "Kitty" series - I have separated them in my tables below for clarity. Due to size constrictions, titles outside of the classic series are listed on the Swedish 2 page. Please refer to my article in the August 1998 issue of Yellowback Library (Number 170) for more details on this publisher. To the right is the earlier format of the Kitty books, with the red cloth spine. These all had original artwork created for the Swedish market; many were done by Bertil Hegland, which imitated the Gilles or Nappi covers that were available in the U.S. at the same time. Other illustrators from this era were Rikard Lüsch, who used a harsh, impressionist style, and Ulla Urkio who did many psychedelic renditions for the Kitty series. Digest size hardback - 7" H x 4 7/8"" W; spine is red cloth with catalog number at top, "Carolyn Keene:" and title in black capitals; matte finish appliqué covers on front and back. Kitty och diamantstölden (The Mystery at Lilac Inn). Artwork by Bertil Hegland, copyright © 1970 by B. Wahlströms Bokindustri AB, Falun. To the right you can see an example of the later Wahlströms format, the one which is used today. It is more of a glossy finished picture cover than the earlier versions. While my example has Norma Miralles artwork (who also illustrated the Sparrow (UK) paperbacks of the Dana Girls series), recently these books have used American artwork rather than create their own originals. Originally the Wahlströms books were marketed under the "flickböcker" series, meaning "girls books." In the 1980s Wahlströms introduced their "ungdomsböcker" line, which translates to "books for the young." Both boys' and girls' books would have been issued with the ungdomsböcker label. The Kitty books are found under both monikers. More information on this series can be found at Wikipedia Sweden. Also, Kitty fan Anna Rispan maintains a blog (mostly in Swedish) about the Swedish editions. 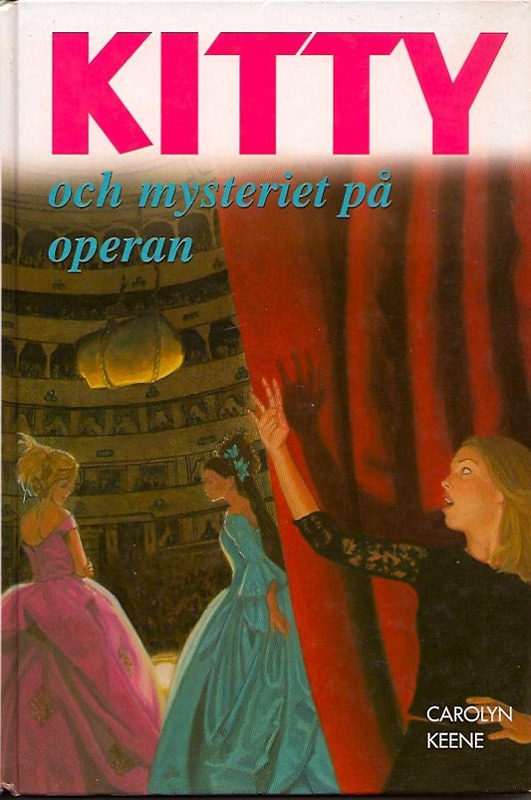 Kitty och spindelmysteriet (The Spider Sapphire Mystery). Artwork by Norma Miralles, copyright © 1991 by ScandBook AB, Falun. Several of the stories were issued only in a taller format and not under the shorter red spine editions above. There are two heights and the 9" version may have been part of a book club offering - they have a badge on them which denotes them as "Ungdoms Favoriter" or "youth favorites." Large size glossy hardback - 8 1/4" or 9" H x 5 1/2" or 6 1/8" W, white spine, title with "KITTY" in big letters (usually pink), Carolyn Keene. Kitty och mysteriet på operan (Intrigue at the Grand Opera). Artwork by Patrick Whelan, copyright © 2003 by Simon & Schuster, USA. Nancy and the vampire cave? This publisher also released a few Kitty titles, and seems to have done a joint venture with Disney for a book club release. A tall version of Old Attic (1990) and Jewel Box (1991) were released through this publisher in conjunction with Disney's Ungdombokklobb. Large size glossy hardback - 8 1/4" H x 5 " W.
Kitty och det mystiska juvelskrinet (The Clue in the Jewel Box). Artwork by Boada, copyright © 1988 by Richters Forlag AB, Malmö.